Unfortunately, many customers come to Collars when something has gone wrong, whether as a result of an accident, failure or simply neglect. Speaking to us about a new mast is not nearly as daunting as it might first appear. We aim to handle the whole process, but at the same time welcome as much input from the client as possible. Although a like for like replacement is often required, we need to establish why the original mast failed, and look at possible options to improve the spar, both in terms of construction, as well as the systems and fittings. Getting the basic information to establish a formal written quotation is always the first step with all spars, and the link to our mast quotation page will guide you through the information we need. We have had dealings with most of the marine insurance companies and, although they all operate differently, dealing directly is not a problem, should they suggest this. Once a quotation has been accepted, we then need to look carefully at the information. With our extensive drawing archive, we are sometimes able to work directly from the original drawing. However, more often than not, we may well ask for confirmation on some of the details. 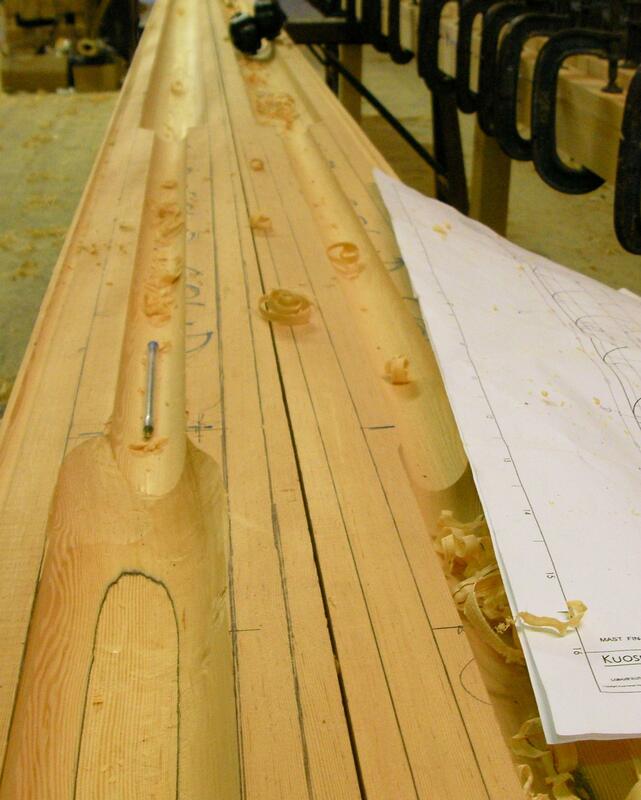 Take one of the simplest mast, a Drascombe Lugger, there are five different mast lengths, two different foot details, and two different top details that have come about over the years, so it’s worth checking. If we don’t hold the drawing for the spar in question we would suggest getting the old spar back to our workshops to be used as a pattern. We can easily organise this, either on our own trailer or by carrier as a 3rd party collection. It does not matter if the spar is cut into smaller lengths for transport. On all replacement spars we try and use as many of the existing fittings as possible, unless they are beyond serviceable use. When this is the case we would organise replacements, and all costs are forwarded to the client for approval. We welcome visits from the client during production, if convenient for them and ideally, once the spar is finished, we would encourage a visit to sign off the work.